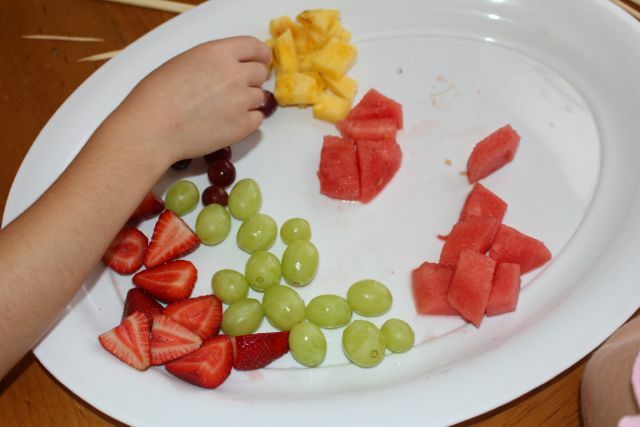 With all the lovely summer fruits out at the moment, we have been eating a lot of fruit salad. The kids would probably live on fruit if they could. 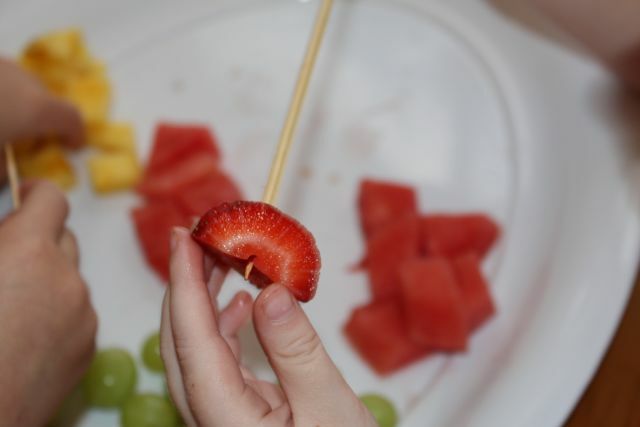 Instead of just cutting up the fruit and mixing it together before adding it to bowls for everyone, today we decided to make some fruit kebabs. It was pretty simple. I washed the fruit and cut it into chunks and put them on a tray. We had watermelon, pineapple, two types of grapes and strawberries. I left the grapes whole. Any fruit firm enough to be threaded onto skewers would have worked, but these are the fruits we are enjoying at the moment. Threading a strawberry carefully onto her skewer. I discovered I only had jumbo skewers, rather than the standard sized ones in the drawer, so our kebabs were a bit bigger than normal. 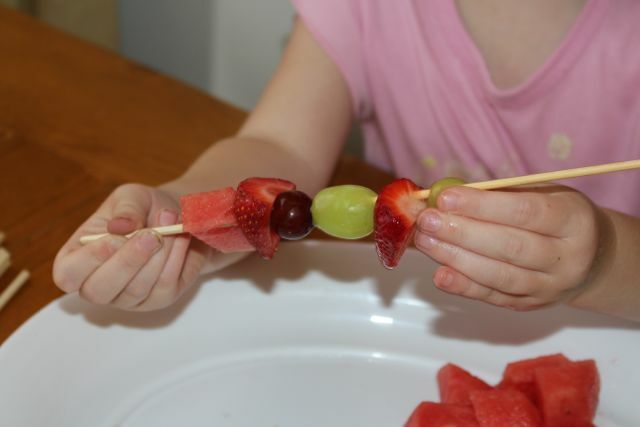 The kids also made some mini-kebabs with toothpicks, which really only fitted a couple of pieces of fruit. Soaking the skewers in water for half an hour or so can reduce the incidence of little splinters from the skewers coming off on the fruit, but I didn’t do that today as the kids were too impatient to wait. Luckily for us, no splinters! I let the kids make their own kebabs by threading on whatever pieces of fruit they wanted. A found this quite easy, but L often threaded her pieces of fruit too close to the edge, and some of them broke and fell off. They made a couple of kebabs each, and then there was all the fun of eating them!